Round brilliant cut diamonds are by far and away the world’s most popular diamond shape, but the criteria we use to separate one’s value from another can feel overwhelming and may well change for buyers in the future. We all know the ‘4C’s,’ that familiar line up of characteristics that lets us know how ‘good’ a specific diamond may be: Carat, color, clarity, and cut. Traditionally, it’s in that order because most of us first want to know how big the diamond is, then how white and clear it is, then that nearly forgotten factor lingering in the back – how well it was cut. Who cares about cut? 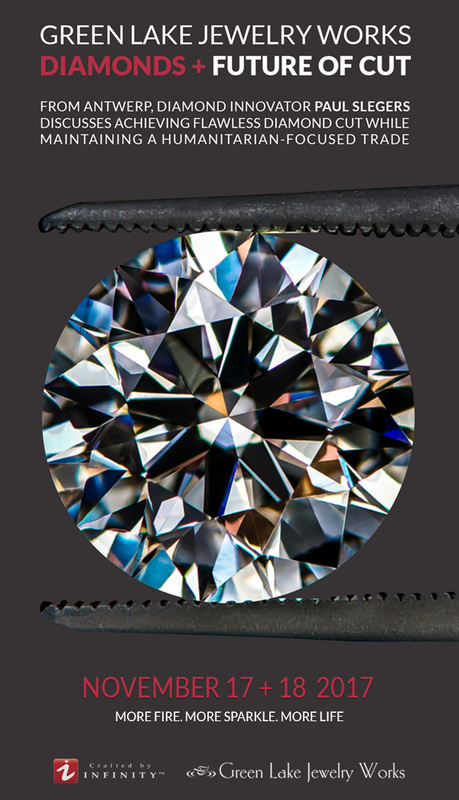 Well, if you look at two diamonds in person that maintain an identical carat weight, color, and clarity, but differ slightly in cut grades – from ‘very good’ to ‘excellent’ – then cut’s importance becomes rather glaring. You see, cut determines how much light a diamond is able to reflect back at you, and when it reflects the maximum amount considered possible – with an excellent cut grade – you’ll see all that fire and brilliance for which only diamonds are known. For every diamond Crafted by Infinity facets, there are 100 rough crystals that are rejected outright. By starting with cleaner rough, consistency with eye-clean finished diamonds can be achieved. Image courtesy of Crafted by Infinity. In fact, the Gemological Institute of America (GIA, the world’s foremost authority on gemstone grading) contends that cut grade is the most important factor in determining the overall appearance of a diamond because a poorly cut diamond will seem dull even with excellent clarity and color. 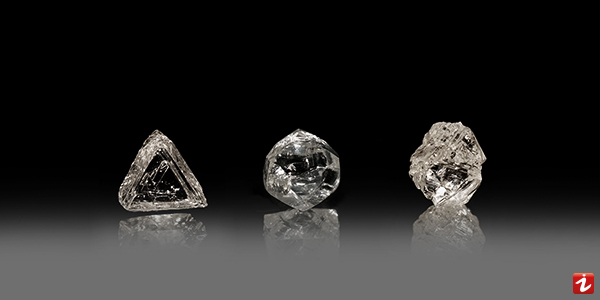 However, when upward of 70% of all round brilliants in the market today are graded ‘excellent’ by GIA – and new lab-grown diamonds entering the market are indistinguishable from diamonds that took millions of years to form deep within the earth – it seems excellent diamonds are more common than ever. A handful of specialized diamond cutters around the world have sought to improve on this kind of excellence, crafting instead an even more ideal cut by using superior crystal selection, scientific planning, and flawless quality control. In turn, these measures have achieved visual results that exceed all of the traditional performance metrics seen on most certifications. 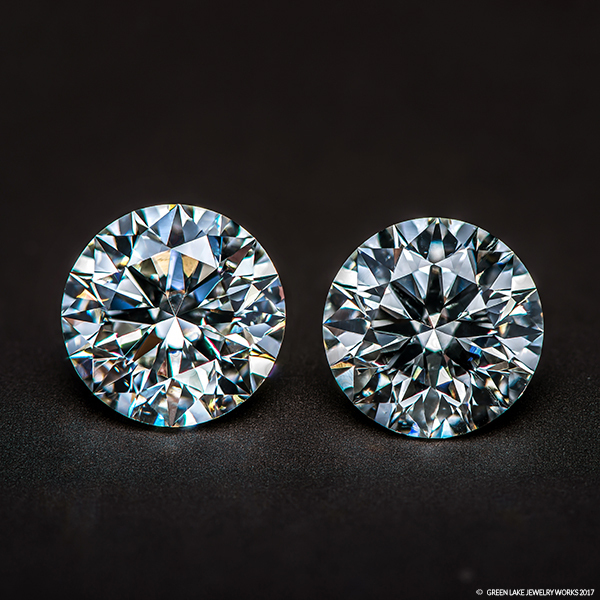 These ‘super ideal’ or ‘high performance’ diamonds start out with a rough material that’s already cleaner than most that supply a majority of diamonds in the market. What’s more, they’re cut for more beauty over just a bigger yield, with a focus on critical angles that get light rays in and out faster which results in greater intensity. These are diamonds that offer edge-to-edge brightness and whiter appearance with bigger, bolder bursts of fire. To put it simply, these diamonds appear larger, whiter and more sparkly when placed beside an equivalent with the exact same carat weight and color grade. Take for comparison this 1.53ct H VSI super ideal cut round brilliant beside a 1.54ct H VS2 round brilliant with excellent cut quality. Both of these diamonds are exquisite and virtually identical on paper, but the diamond on the left sourced directly from Crafted by Infinity in Antwerp looks slightly larger, brighter and with more sparkle. The difference in cost between these diamonds pictured is only $100. This is why cut-quality is the future. Most diamond consumers today will start their journey online, poring over certification after certification, tallying the 4C’s and reconciling it with an increasingly uniform yet obscure pricing structure. But when they actually view the diamonds in person, even ones that are identical on paper, subtle differences become clear. By prioritizing cut from the start, and arranging to see them in person early-on, buyers can begin narrowing down a selection of diamonds that look better, faster. And if in the end, it’s a diamond that’s significantly brighter with more sparkle that you’re after, then these diamonds specially cut for optimal light performance are a must to view. 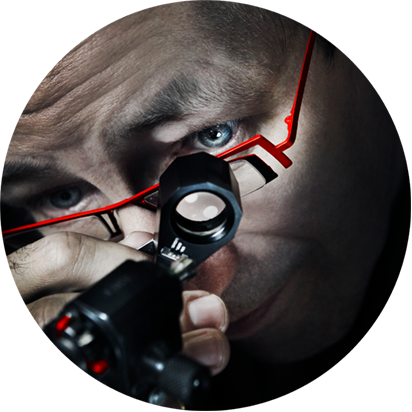 Paul Slegers is a regular consultant on diamond cutting and has spoken at numerous conferences in Europe, Asia, and North America on emerging practices in the industry. After 25 years in the mass-manufacture and trade of rough and polished diamonds, Mr. Slegers transitioned from Chief Operating Officer at the world’s premier diamond-cutting tool manufacturer – as well as with a De Beers’ sightholder – to focus on a more small-scale, craft-oriented approach to diamond cutting. The company he founded in Antwerp, Crafted by Infinity, employs meticulous crystal selection, scientific planning, and flawless quality control to create a diamond with consistently bolder bursts fire and superior sparkle than we at Green Lake have ever seen. Green Lake Jewelry was honored to host Crafted by Infinity for their first-ever visit to the Pacific Northwest at both our Seattle and Bellevue Studios this past November 2017 for an evening talk about trends in the diamond industry, humanitarian-focused trade and achieving flawless cut. Contact us at gemstones@greenlakejewelry.com to inquire about next years event. If you’ve never been to a Green Lake Jewelry Works design studio, then you might assume the company is like any other high-pressure jeweler. The fact is, however, we are anything but. Because the core of what we do is custom made wedding rings and hand-cut gemstones from our open workshop, we’re more focused on educating clients about the materials and techniques best suited for jewelry that we can guarantee for a lifetime of wear. Whether you are looking to purchase your first diamond or invest in a new one, we welcome you to meet directly with our team of GIA Graduate Gemologists and Diamond Council of America certified gemstone buyers, who maintain direct relationships cutters both local and abroad. Our artists at work are happy to guide you toward the diamond that’s perfect for you. Email us at info@greenlakejewelry.com or call us today to schedule a time to meet. 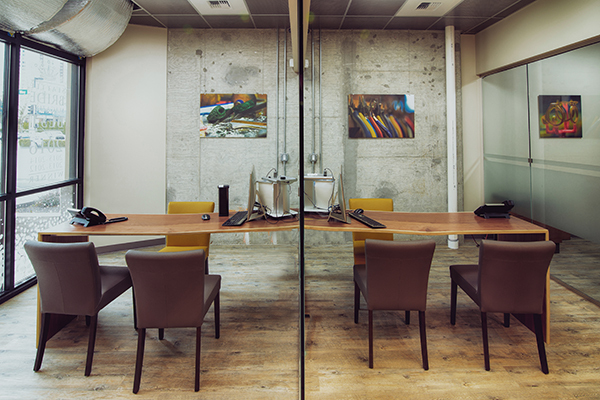 Private design rooms like these pictured at Green Lake’s Bellevue studio offer tons of space and natural light to view diamonds at your convenience. Laboratory grading tools at hand also allow you to see elements of a diamond listed on a certification that’s not visible to the naked eye.